We have gained recognition as an eminent enterprise, devotedly engaged in offering a broad range of Customized Embossing Rollers. Using quality tested raw material with the aid of innovative techniques, this Customized Embossing Rollers is manufactured under the direction of adept professionals at our well-equipped production unit. Apart from this, we offer our entire range of Customized Embossing Rollers in several specifications, in order to meet various needs of our clients. Our clients can avail this roller at industry leading prices within stipulated time frame. Leveraging on our modern infrastructure facility, we have been able to deliver superior quality Rotogravure Cylinders that are widely used in flexible packaging, printing, textile, pharmaceuticals, vinyl and many industries. 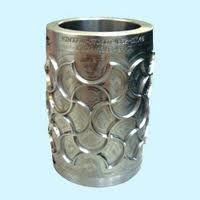 Our range includes Joint Less Anilox Rollers, Embossing Roller and Rotogravure Cylinders. Available in various sizes, these products are manufactured using superior quality raw material procured from reputed vendors. Manufactured in compliance with industry standards, our range is stringently checked and tested using sophisticated machines. Further, to sustain our capabilities and serve the clients in more effective manner, We have employed a team of expert professionals. Their valuable experience and expertise assist us in customizing the range as per the needs of the clients. In addition, our sound manufacturing unit allows us in delivering both large and small order within specified time frame. Quality products line, cost effective pricing, transparent deals and customization facility have helped us in garnering huge client base in Indian Subcontinent. Plot No. 249-250, Road No. 1, G. I. D. C.